The Uptons steak bar and bistro has now been open for a few months, and we love it! At number one on the menu is our bacon sandwich (served with or without egg). We cure the bacon ourselves with fennel, black pepper, salt and brown sugar, using an old cut called the collar; a tasty, marbled shoulder cut. We dry cure to reduce the water content – unlike the higher water content of most cafe bacons – hang the bacon to dry, and then smoke it over oak. You may not be surprised to learn that the Uptons full English breakfast is the next favourite on the menu. We make the chipolatas, dry cure the bacon, make the black pudding, buy the bread from Jim in Netley, and Wayne lays the eggs. Just kidding; the eggs are reared free range in Romsey. We should have opened a bistro years ago, we’re enjoying every minute of preparing and serving delicious morsels to you all! Don’t share our regret – call in soon for brunch, a full English, small plates, salads or just a coffee and cake. We’re open Monday to Saturday from 7am to 5.30pm: browse the full menu here. 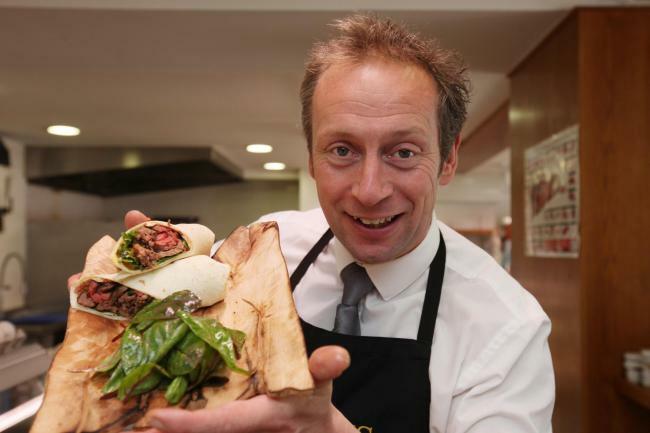 Southampton butcher Simon Broadribb’s fillet steak, rocket and chipotle relish wrap has reached the finals of the prestigious British Sandwich Association’s Sandwich Designer of the Year competition. 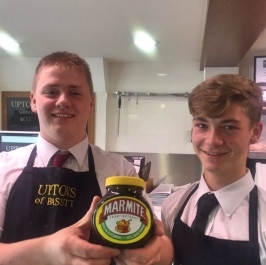 Simon is the owner of award-winning Uptons of Bassett Butchers. Read the full article on Daily Echo’s website.